This completely rebuilt and revamped 46-foot Guthrie Flybridge Sportfisher built in North Carolina fishes out of Pez Vela marina in Quepos. She sports a full-size tuna tower, a 14ft beam, and two staterooms which sleep four guests. 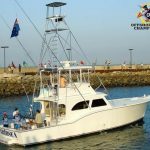 Captain Glenn Morales, with over 20 years’ experience fishing in Quepos, is at the helm, assisted by mates Tio and Fausto. All three are native Costa Ricans, and speak English. The boat carries a full range of heavy and light tournament-class tackle, some fly-fishing gear (although anglers who want to fly fish should bring their own – the boat team will advise on weights, reels and flies), and full electronics, including GPS, depth sounder and marine radio. She also carries a complete range of USCG-approved safety equipment.